When I first started blogging years ago, I had literally no idea about any of the perks of the blogging world. Now, one of the funnest parts for me is all of the fun local events to go to, trying the newest foods and meeting people I look up to. On Monday I got to attend the Sweetgreen x Toro Bowl launch party at the South End’s Ink Block location. It was packed with media, Ink Block residents and Boston’s biggest Sweetgreen fans – oh, and also Ken Oringer of Toro, Coppa, Uni, and Little Donkey! He’s a celebrity chef from Boston to San Francisco, so it’s no wonder that this is Sweetgreen’s first collaboration in Boston. Read on to see what we thought of the Toro Bowl! Those who follow me on IG will recognize many of these fun event shots from my IG Story! 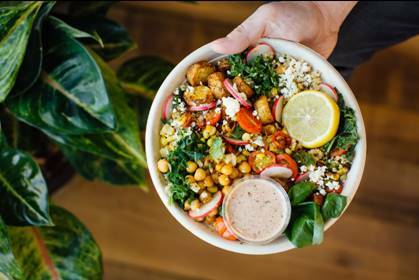 The Toro Bowl in all its glory, with both quinoa and kale so you get the best of both super healthy worlds, hot chickpeas, roasted potatoes (SO good), corn / tomatoes / jalapenos, local radishes, basil, feta, lemon squeeze, Sweetgreen hot sauce and charred jalapeno yogurt dressing. This bowl has everything a good salad needs – tons of healthy ingredients, local produce, bright & fresh flavors, and hearty bites to fill you up. As you probably surmised from the ingredient list, there’s a kick to this one! I’m usually a baby about spicy foods, but this one is mild and just gives it added interesting flavors. Casually hanging out with Ken, nbd. We got to take home some samples of the delicious hot sauce! I love Sweetgreen’s fresh & healthy salads, and collaborations like this make them even more exciting. They even change ingredients every season so you can try different flavors throughout the year. If you’re in Boston and haven’t tried the Toro Bowl yet I highly recommend it! Comment Challenge: Have you been to a Sweetgreen? What did you think? Next Post Blue Ruffle Cold Shoulder Dress + Exciting Announcement!